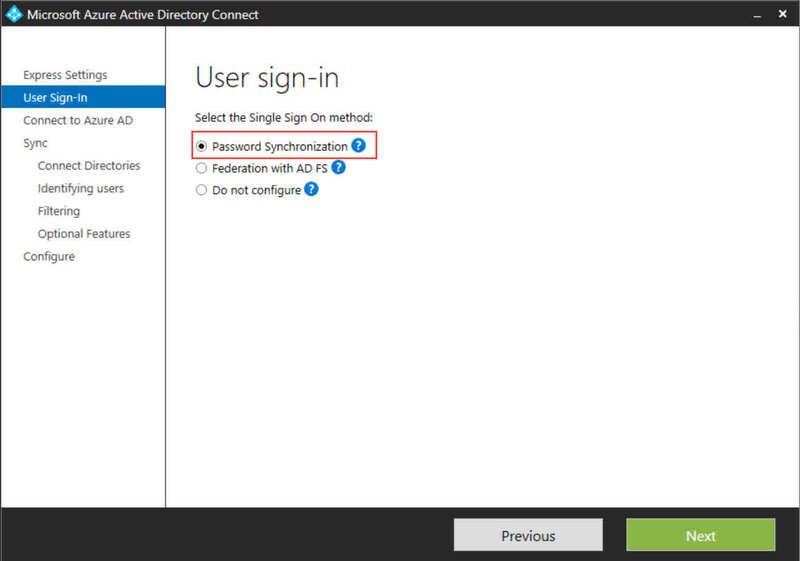 Setting up your identity bridge using Azure AD Connect requires you to choose authentication/user sign in methods for your users as in the screenshot below. If you for example have chosen to use Password Synchronization and later want to reconfigure your solution to get SSO with ADFS, you don’t have the possibility to change authentication mode in the AAD Connect wizard after having it configured once. 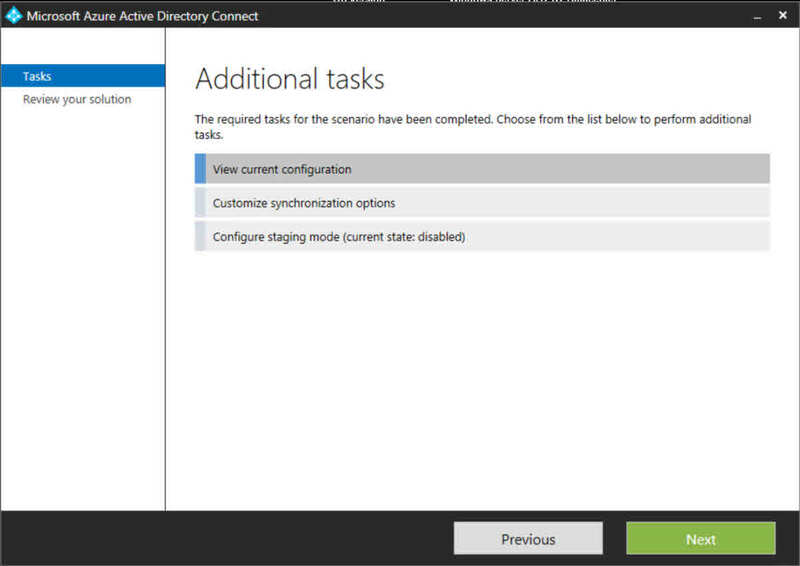 In this case, we could of course just configure our ADFS servers from outside AAD Connect to achieve our goal with SSO. If we really want to use AAD Connect, we have to “reset the state” of AAD Connect. How this is done is described in KB3008643. The KB do however refer to an xml file which should be present in %LocalAppData%. Trying to do a “state reset” a while ago, I didn’t manage to find the file there. I did however find a file named PersistedState.xml in C:\ProgramData\AADConnect. Hopefully the KB article will be updated to reflect the reality soon. Renaming the PersistedState.xml file will make the wizard run as it did in the initial state, where you have the possibility to change the authentication settings. Keep in mind that you will need to reconfigure all other settings again. If you are unsure about the settings, make sure to make a proper backup of your synchronization settings prior to doing any changes. Hope this helps if running in to this issue and let me know if you have any questions! 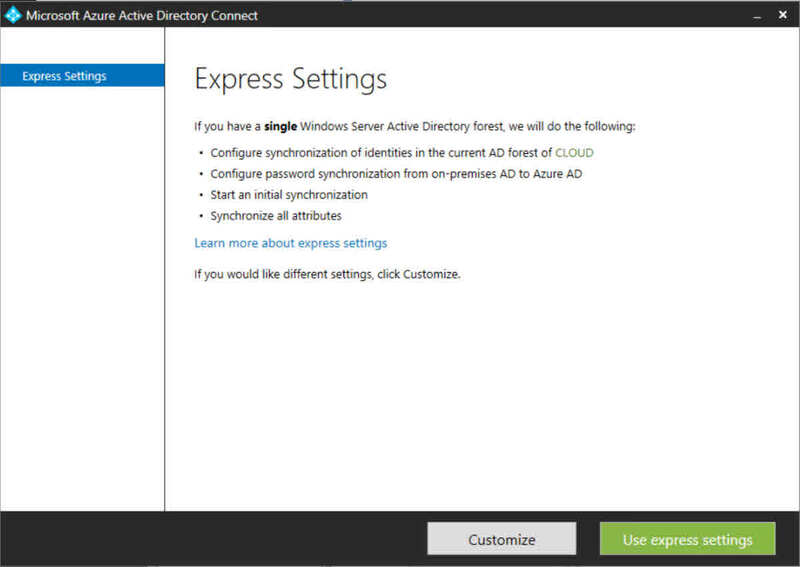 This entry was posted in Azure, Office 365 and tagged Azure AD Connect, PersistedState.xml, Reset state AAD Connect, Reset state azure ad connect on September 27, 2015 by Johan Dahlbom. I love this script and the approach to run it in Azure. Where you have implemented this, how do you manage additional licenses, say that a user should have E3 and Project or Visio? some licenses cannot coexist, like E3 and Exchange Online, but others can like Project, Visio and CRM for instance. How to make sure that they only can have one of the “baseline” licenses and multiple och the additional licenses? Any ideas? If you can help me with an idea of how to solve it I can probably code it myself.